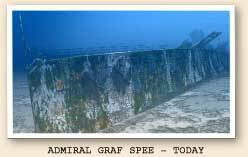 The Graf Spee lays exactly where she sank in 1939. She is in 65 feet of murkey water inside the Rio de la Plata about 3 miles from Montevideo, Uruguay. When the great ship first reached the bottom, much of her superstructure was above water. However, today nothing remains above the surface. 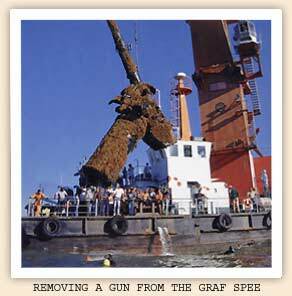 In 1997 Mensun Bound of The Lost Ships TV series and Hector Bado gained permission from the Uruguayan government to remove one of the Graf Spee's guns. 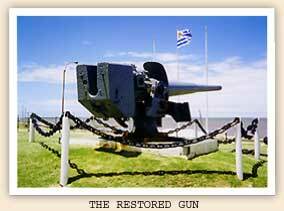 This gun was restored and now rests in front of Montevideo's National Maritime Museum.